Female internees at Gloucester City dancing for Justice Department audience in 1943, reportedly hoping to win their release. Note fence around facility. National Archives Photo. 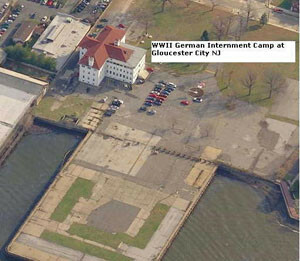 The U.S. Immigration Station which held detainees near Gloucester City, New Jersey was a large, converted Victorian house on South King Street, in an industrial area across the Delaware River from Philadelphia. It held male and female detainees temporarily who were on their way to other more permanent facilities. Many women, however, were held for extended time periods. The facility held approximately 50 individuals at a time. Reports indicate that the internees were reasonably well cared for and liked the officer in charge very much. 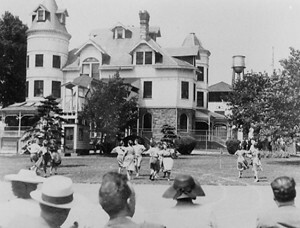 Pictured above is a field day in which the internees performed German songs and folk dances for DoJ officials, many original compositions. Fox, Stephen, Fear Itself: Inside the FBI Roundup of German Americans during World War II, iUniverse 2005, p. 170-171. “Women were issued a pair of shoes and a dress, men shoes and work pants, plus two free packs of cigarettes each week for both. Internees could earn 80 cents a day making handicrafts and were allowed to keep up to ten dollars at a time. Anything more was held in an account. … As in all camps, all internees were entitled to regular visitors, although strict rules of nondiscussion and message censorship applied.” Arnold Krammer, Undue Process: The Untold Story of America’s German Alien Internees, Rowman and Littlefield, 1997, p. 86-87. One craft item the women keep for themselves: a small leaf with two acorns. The back of the pin had a tag with the wearer’s date of arrest with a blank for the date of release. Fox, Fear Itself, p.171. Although a model camp, Internees tell of much anguish, because many of the women were mothers of young children. According to Stephen Fox, in his book, Fear Itself, one internee wrote a group letter to Attorney General Francis Biddle, begging him to release the women. She wrote that despite the good care they received, the “’sudden and unexpected separation’ from families, their removal from useful occupation, and the suspicion cast on their characters and reputations had caused a general decline in the women’s health.” DoJ’s response was that the married women apply for transfer to the family camp. Fox, Fear Itself, p. 171. (See also: Crystal City Internment Camp) Another example of the difficulties of mothers and children being separated is the story of this then 9-year old son of a former internee. He speaks bitterly of the fact that he had to be placed in an orphanage while his mother was interned because his father could not work and care for him. The Gloucester City facility has been renovated and is now the headquarters of Holt Oversight and Logistical Technologies seen above.